PARIS (AP) — William Kearsey’s war was long over by the time his son ever heard about it. By then, the World War I veteran had undergone 28 surgeries to knit back together the bones and flesh of his face, which was shattered in a trench in Belgium in 1917. A century after fighting in the first war of its kind ceased, Kearsey’s son, Peter, stood on a rain-soaked avenue in Paris on Sunday to honor the armistice that ended the war his father and so many other soldiers endured. Official commemorations held to mark the 100th anniversary of the agreement between the Allies and a defeated Germany that silenced guns on the Western Front have provided an opportunity to contemplate the implications of the first war of its kind. But for the children and grandchildren of soldiers who were injured or killed in more than four years of brutal fighting, the centennial offered a moment to reflect on the enduring toll of decisions made by world leaders very much like the presidents, prime ministers and kings also standing in the rain. In central London, thousands of people marched in a “people’s procession” to honor fallen soldiers. Descendants of many veterans attended the march , which was described as an expression of gratitude for those who fought in WWI and other conflicts. Participants passed central London’s Cenotaph war monument, where senior members of Britain’s royal family and national leaders had placed wreaths earlier in the day. Among them were Marion Lewis and Dorothy Heslop, sisters who said they wanted to honor their grandfather. Pvt. John Waters who suffered a severe head wound during World War I while fighting in France. “They did not expect him to survive, so they left him outside the medical tent and we think it’s the cold that probably saved him,” Heslop told Britain’s Press Association. Growing up, they said, it was an unspoken rule not to ask granddad about the war. Oliver Davies was a 21-year-old driver for the Royal Engineers when he was hit by a stray bullet while taking animals to water near Jerusalem in 1917. His family still has the letter from Davies’ captain informing his mother of his death. His great-grandniece, Jackie Sheridan, attended the London march. As for William Kearsey of Australia’s 33rd Battalion, he survived the trench in Belgium hit by enemy fire because of a friend who dragged him out. But coming home with severe damage from the first war to use industrial-era war equipment like machine guns, Kearsey faced a new hell. His injuries included lost sinuses and tear ducts. 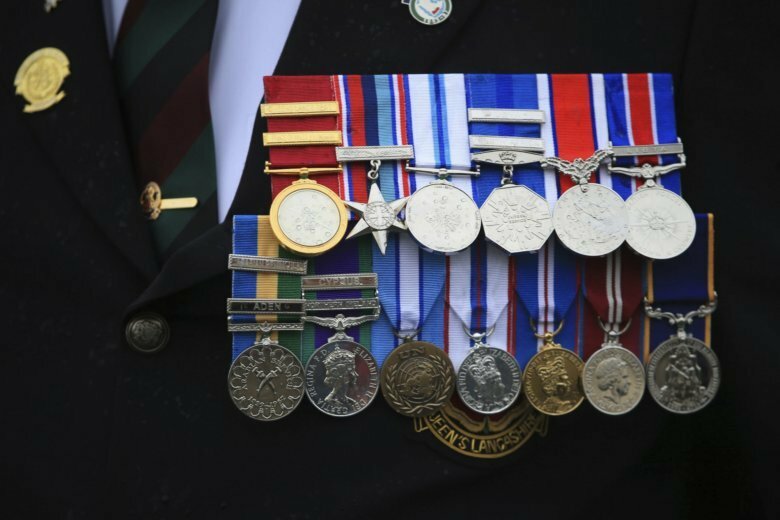 But years of surgery in Britain and South Wales gave the veteran another chance at life, Peter Kearsey said of his father, who died in 1971. “He was a kind, gentle man. He suffered a lot right up till his death,” the son recalled. Some 62,000 Australians died on the battlefields of the Great War, and 150,000 were injured, according to Kerry Neale of the Australian War Memorial. She stood with Peter Kearsey and his wife in the rain. “He didn’t talk of the fighting, except how he was saved by his best friend,” Kearsey said.